Most other companies struggled to sell computers. Sorry, folks, those hopes of the PC market making a comeback were short-lived. 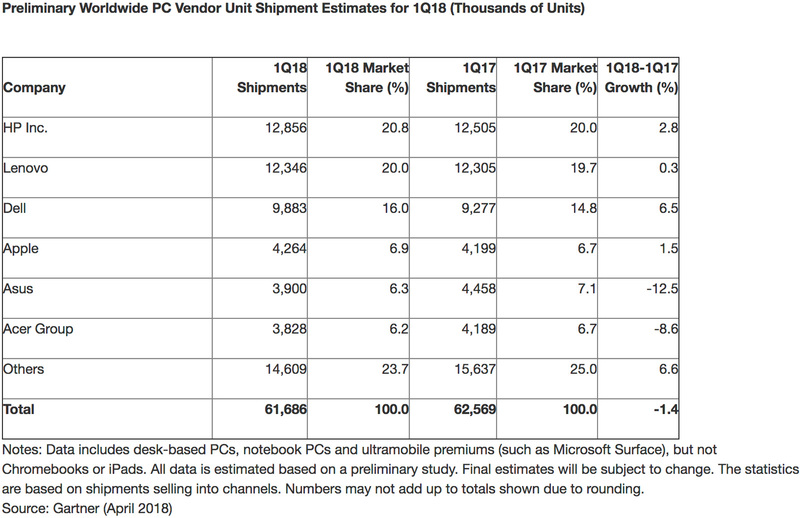 Both Gartner and IDC estimate that computer shipments were down in the first quarter of 2018, ranging from barely under zero growth (IDC) to a drop of 1.4 percent (Gartner). While the exact numbers vary (Gartner includes more tablets in its data than IDC, but not Chromebooks), there are some common themes. In particular, Dell came to the industry's rescue -- it was one of the few bright spots in a market where rivals either saw sluggish growth or declined. Both analyst teams determined that Dell's shipments grew about 6.5 percent year-over-year, or significantly above behemoths like HP (4.3 percent under the best estimate). Simply speaking, its performance grew just about everywhere. Gartner credits it to strong business sales, but it didn't hurt that Dell released big updates to home-oriented systems like the XPS 13 at the same time. There's also a consensus on the cause of the decline: Asia-Pacific. Shipments dropped sharply in the area, particularly in China where the government and large companies held off due to the National People's Congress and the expected big shifts in priorities and workers. For that matter, it didn't help that many companies were reluctant to update their PCs ahead of new Intel chips. The future, meanwhile, is unclear. IDC saw hope in the rapidly burgeoning gaming PC industry as well as improved demand for Windows 10 PCs in business. However, we've seen this story before -- analysts have a habit of being cautiously optimistic. Computer shipments haven't seen significant growth for years, and that's unlikely to change so long as smartphones dominate and years-old PCs are frequently good enough for people's needs.